Yes, LIVER! You read right! Liver is hands down one of my favorite foods to serve to my little guys. It is tender, slightly sweet, but more than that; it’s a true powerhouse of nutrition, out performing the most expensive supplements on the market. Liver is an amazing source of various nutrients such as iron, vitamins D, A and B12, magnesium, manganese, potassium and phosphorus. The best part is that these nutrients are readily available in their easiest digestible form, which means our bodies can use it right away. If you have anemia, taking a couple teaspoons a day will do wonder to your health. And it’s Paleo! I usually chop my liver into one inch cubes but I sometimes grind it to add to soups or my meatball recipe. It's important not to over cook the liver or it will get chewy. Cooking for 5-10 minutes it's all you need to have the perfect tenderness. Also choose liver from grass-fed and/or organic sources. 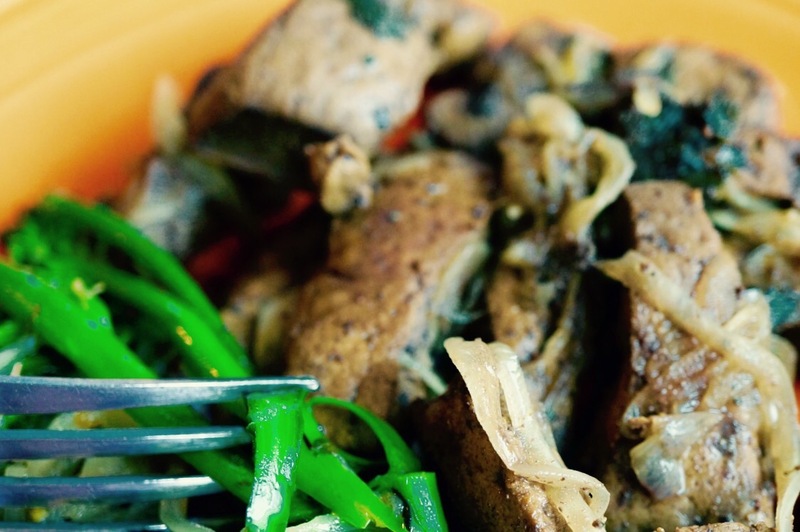 In a bowl combine liver, sea salt, onion powder, fish sauce and coconut amino. Cover the bowl and set it in the fridge to marinate for 30 minutes. In a large sauce pan sauté onions in ghee adding a pinch of sea salt. Cook until onions are translucent, remove it from pan and set aside. Turn off the heat, add sage and onions and stir until well combined. Serve with your favorite side vegetable or cauliflower "rice".